One of the most well-known upper body exercises out there -- the bench press -- is a test of strength that even the NFL uses to gauge its athletes. Despite its macho-man reputation, the bench press is a great exercise for anyone looking to gain muscle size and strength in the upper body. This exercise is known as a compound exercise, meaning it involves multiple joints, and therefore multiple major muscle groups to execute. You can use <ahref="http: www.livestrong.com="" article="" 107367-dumbbell-press-vs.-bench-press="" "=""> </ahref="http:>a barbell, dumbbells or certain cable machines to perform a bench press. There are also a few variations of the bench press such as the incline bench press and decline bench press which you can do by changing the angle of the workout bench. The bench press was ranked as the number one chest exercise by the American Council on Exercise and taxes many upper body muscles. Shoulder, chest, arm and back muscles all contribute as you slowly lower and then press the weight up. It even involves some leg muscles to keep your body under control during the movement. The pectoralis major is one of the prime movers in the bench press. These muscles are also known as "pecs," and act to bring your arm across your body. These are the same muscles that allow birds to flap their wings, which is a slightly similar movement to the bench press. Your shoulder muscles are also known as the deltoids and are broken up into three groups: the front, middle and read deltoid. In a pressing exercise like the bench press, you are pressing with the front deltoid. Along with the pectoralis major, your deltoids are one of the prime movers in the bench press and share an equal amount of the workload, according to this Brazilian study. The triceps are a three-headed muscle ("tri" means three and "ceps" is short for heads). They are located on the back of the arm and run from the shoulder to the elbow. They are the third major pressing muscle and help lock out the elbow, which is the beginning and end position of the bench press. Read More: What Are the Benefits of Bench Presses? 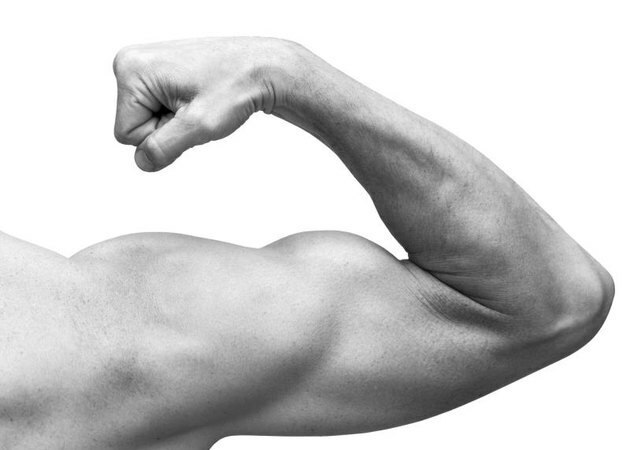 The biceps are on the front of the arm, opposite of the triceps, and normally help bend the elbow. Since the weight you use in the bench press is bending your elbow for you, the biceps play a stabilizing role by controlling the weight as you lower it towards your chest. However, they don't do much work once you start to press the weight up, according to a 2009 study published in the journal of Medicine and Science in Sport and Exercise Science. Your lats are the big muscles on the sides of your back, which, if they are large enough, look like wings. They are powerful muscles that help control your shoulders in the bench press. When the lats contract, they pull your shoulders down towards your hips, which in the bench press is a more stable position. If the lats don't help control your shoulders, the weight that you are holding can cause them to rise up towards your ears, making them less stable and more prone to injury. In a proper bench press, your feet are on the ground and your legs are helping to keep you stable. If you don't use your legs during the bench press, you will feel more wobbly on the bench because your legs are the base that prevents you from tipping to the left or right. When your feet are firmly planted during the bench press you will naturally strain with your quadriceps while pressing the weight up by pushing your feet into the ground. This is helpful because it gives your upper body extra support. A comparison of successful and unsuccessful attempts in maximal bench pressing. What Muscles Does an Elliptical Trainer Work?